Nothing to do with retirement or going to the Seniors tour then. Whilst action continued in Barnsley this week for the German Masters qualifiers (two rounds), Ronnie met fans and signed books yesterday in Bluewater. 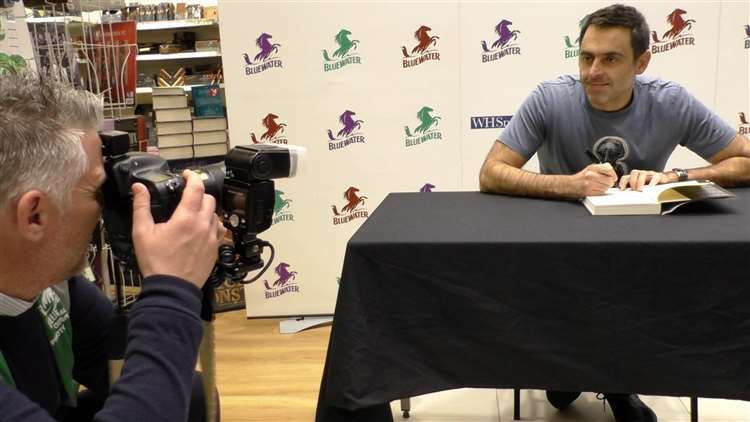 Five-time snooker world champion Ronnie O’Sullivan delighted fans young and old when he popped into Bluewater. The top sportsman was at the WHSmith store signing copies of his newest book, Soho Nights thriller, The Break. 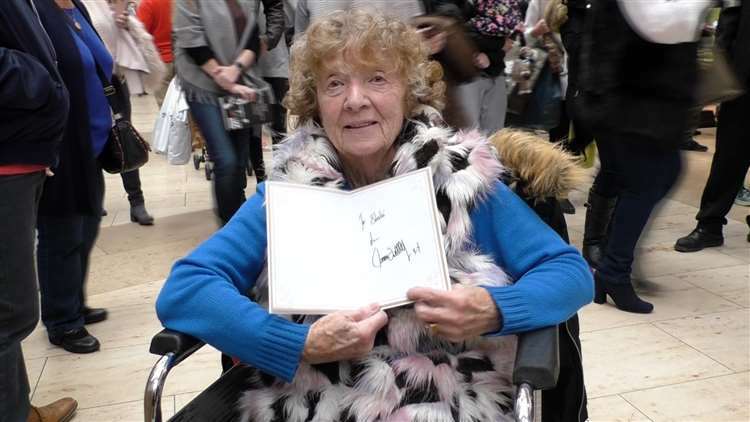 Pensioner Sheila Ulph who is from Chatham, is probably Kent’s oldest Ronnie fan. Mrs Ulph, 91, got a signed card from him because by time she got there yesterday, all his books had sold out. She was delighted as her daughters had not told her they were taking her to meet him. Mrs Ulph said: “As far back as I can remember watching snooker with my husband (I have been a fan). “I didn’t know I was going to meet him – it was a total surprise from my two daughters. However, she said he would treasure the signed Christmas card she had received from him. Her daughters say their mum has also turned down days out with them and opted to stay in to watch Ronnie play in matches and finals. “She also put bets on him winning whenever he played. Mrs Ulph added:”Every time I saw him whether he won or lost, it was good. Hundreds of people went along to meet the sportsman turned author including a young baby which he held and posted for photos with. His book explores the gangland world of ’90s Soho. Set in 1997, when Cool Britannia’s in full swing and Oasis and Blur are top of the pops and it feels like the whole country’s sorted out for E’s and wizz. But it’s not just UK that’s on a high, life’s looking up for Frankie James too – the main character in the book. Frankie’s paid off his debts to London’s fierce gang lord, Tommy Riley. His Soho open snooker tournament is about to kick off at his club. The future looks bright, but then Frankie finds himself being blackmailed by a face from his past. They want him to steal something worth millions and it is enough to get him killed or banged up for life. Frankie’s going to need every ounce of luck and guile that he’s got if he’s going to pull off the heist of the century and get out of this in one piece. The Break is the third, fast-paced Soho Nights thriller, written by O’Sullivan. Since turning professional in 1992, he has clocked up number of awards and trophies, including the UK Championship, the China Open, the Regal Championships, the Benson and Hedges Masters and the British Open. In January 2000 O’Sullivan won the Nations Cup for England, boasting the best record of any player, 13 wins from 15 frames played. In 2016 he turned his hand to fiction, publishing his debut novel Framed. The last part of the article is just a cut and paste from the “trailer” on Amazon and what they chose to “highlight” regarding Ronnie’s record just baffles me … but there you have it. Whoever wrote this trailer probably isn’t a snooker fan. This was my own review of the book. As for the German Masters qualifiers, I’ll cover the first round outcome tomorrow. The Scottish Open 2018 starts today, and maybe not surprisingly, Ronnie has withdrawn from it. Surely winning the UK Championship yesterday has taken a lot out of him and he deserves a break. His next event will probably be the Masters in January. Meanwhile, this podcast by Rhiannon Lambert and Ronnie is worth a listen, especially with the end-of-year celebrations, and over-eating coming soon! Regarding the sports itself, it was announced in the media last week that a ban will be enforced on adds for gambling and betting on TV during sports events. There were many articles in the press about it, and this is one of them, by the Guardian. Online gambling companies have agreed in principle to a voluntary “whistle-to-whistle” ban on advertising during live sports, in an effort to address concerns about their impact on children. A senior gambling industry figure said he would be “surprised and disappointed” if the measures were not agreed and said that while not every online betting firm would support them, all were likely to comply. The whistle-to-whistle ban, which excludes horse racing, would involve the industry falling into line with Labour party proposals. Concern about the normalisation of gambling has risen due to the sheer volume of ads during televised sport. Shares in gambling companies fell on reports of a plan that would restrict their ability to reach TV viewers, while broadcasters are also likely to take a significant hit on lost advertising revenue. One senior executive at a media agency told the Guardian that gambling ads were worth £200m to broadcasters last year, with the majority going to Sky and, to a lesser extent, ITV. This is indeed good news as far as I’m concerned, and it’s not just about children either. But for snooker, a sport that is relying so much on the gambling industry, at least outside China, this might be only the start of a massive issue, very similar to what happened with the tobacco ban. If the bookies see their TV adds cut off, they will be less likely to sponsor live sporting events because the whole point for them is to expose their “brand” and promote their “products”. This was coming, and it baffled me how much in denial so many fans were when I raised the point earlier. I very really hope that WS will act wisely and diversify their sponsoring sources. And it might not be that easy because the strong association with the gambling business has created an image already that many other businesses don’t want to be associated with, especially in mainland Europe. The third volume of the “Soho nights” serries is out since November 15. The Break explodes into the gangland world of 90s Soho, by snooker world champion and national superstar, Ronnie O’Sullivan. It’s 1997 and Cool Britannia’s in full swing. Oasis and Blur are top of the pops and it feels like the whole country’s sorted out for E’s and wizz. But it’s not just UK plc that’s on a high. Life’s looking up for Frankie James too. He’s paid off his debts to London’s fiercest gang lord, Tommy Riley. His Soho Open snooker tournament is about to kick off at his club. The future looks bright. But then Frankie finds himself being blackmailed by a face from his past. They want him to steal something worth millions. It’s enough to get him killed. Or banged up for life if he says no. The Break is the third, fast-paced Soho Nights thriller, by snooker champion Ronnie O’Sullivan. I just finished reading it and here is my attempt at a review. I quite liked the book, better in fact than “Double Kiss”. One reason is that the action starts right from page one, which is good. The plot is rather straightforward – not too many ramifications – but there are a few funny original ideas and characters along the way. I won’t say more, not wanting to spoil your read … The book will not get the Nobel prize of literature, but it’s fast paced, entertaining and the suspense – how the hell will Frankie get out of this mess? – sustained to the very end. Just what you want on holidays or for a chill out couple of evenings. The plot again would work well for an action film. The psychological similarities between Frankie and Ronnie are once again obvious. The questions opened in the previous two previous books though aren’t answered, which probably means that there will be at least one more book to come. We still don’t know if/how Frankie’s father has been framed, and we still don’t know what happened to his mother. Ronnie O’Sullivan will be at WHSmith in Bluewater next month.He will be signing copies of his newest Soho Nights thriller, The Break on Tuesday, December 18, from noon. I just finished reading “Simply the Best” by Clive Everton, so here is my review for what it’s worth. Before I do this though, I want to point at Clive’s introduction and his acknowledgement that Ronnie – politely – declined to co-operate to this book. Ronnie indeed hasn’t particularly friendly feelings towards Clive mainly because he feels that Clive’s reading of and writing about some of his own comments and behaviours aren’t a correct reflection of what he actually felt and meant. This is something I have heard from Ronnie himself. Clive goes through Ronnie’s life and career, nearly year by year, and every significant match Ronnie played is documented by comments made at the time, either by Ronnie himself, or his opponent, and sometimes by others involved like officials or witnesses. As such this book is an invaluable source of documentation as Clive certainly unearthed excerpts of the interviews and press conferences recorded “live” after matches, be it wins and defeats. It doesn’t always make for a very easy read such is the wealth of information offered to the reader. But it does take us to the rollercoaster of emotions and mood swings that paved Ronnie’s career, and it highlights how much working with Steve Peters has changed his outlook on his career and on himself. Clive is firmly convinced that Ronnie Senior’s imprisonment had a profound and durable impact both on Ronnie’s career, psyche and on his life away from snooker. There is certainly a lot of truth in this and, if anything, this was confirmed by Ronnie himself in his “Sporting Live Story”. However, I believe that there is more than just that. I have known Ronnie for more than ten years now, and during the 2010 to 2013 period in particular he opened up to me about how much his “divorce” from Jo Langley had affected him, how lonely and lost he felt, and how he was prepared to do anything to make sure that he would not be estranged from his two youngest children as he had been from his first daughter. Also, when his father was finally released Ronnie had high expectations. Of course he didn’t think that all would be like it was 18 years earlier. He was an adult with children himself, not a teenager. But he thought that they somehow would be a family again. When his parents split, shortly after they were reunited, it hurt him despite his understanding that in 18 years they had inevitably become different persons and grown apart. To me, Clive doesn’t give those events enough importance in his analysis of Ronnie’s mindset at the time. Also, it’s clear than Clive is a big fan of Barry Hearn. There is no doubt that Barry Hearn has done a lot of good and that snooker is now in better shape than it was, although, to rely mainly on one line of business for sponsoring – the gambling industry – is a dangerous thing to do and probably will backfire at a point. However some of the criticisms Ronnie expressed over the years were/are not unfounded. Players are the game’s biggest asset, and it’s the top players who attract the audience. They deserve to feel valued and respected. In his book “On the Road and Off the Table With Snooker’s Greatest”, Jason Francis tells us what the reaction was when Ronnie had a breakdown at the Crucible in 2016: “He will be fined”. Would it have been too much to ask if he was alright? And, in the October issue of Snooker Scene, Clive covers the spat Ronnie had about the Crawley venue at lengths, essentially taking side with WS. But, David Hendon, who, contrary to Clive, was on the site, is giving a very different account, basically backing Ronnie’s claims. Ronnie isn’t the most stable person, he’s bipolar to start with, and many things he says should be taken with a pinch of salt even if he genuinely means them on the moment. But that doesn’t mean there isn’t truth in what he says – in fact beyond the exaggerations and sometimes insults, there usually is truth in it – and I feel that Clive’s perception is biased at times. It certainly is an interesting reading, and one every snooker fan should have in their library. The first thing I’ll say about Stephen Hendry’s biography is what it is not: you won’t find any detailed analysis of any match played by the great man, neither will you find much about the most significant shots he played. If this is what you are after, this book isn’t for you. What this book IS though, is a recollection of Stephen Hendry’s psychological and emotional journey from the carefree debuts on the small table he got as a Christmas present, to winning everything, to not winning anything and, eventually to retiring, and going to promote and play 8-balls Chinese Pool in China. Stephen Hendry takes us with him through the kaleidoscope of his emotions: excitement, hope, realisation of his own talent, reaching his goals, the years of invincibility, the first doubts, the denial, the pain, the depression, and finally a kind of acceptance. It’s quite engrossing and certainly portrays a man very different from the “Iceman” image he carried around for most of his career. Reading this book you won’t learn much new about his matches, but you will certainly come to know and understand the human person behind the cue much better. Stephen Hendry also opens up about some aspects of his private life, and his relationship with his manager and some of his fellow players. “It was a mixture of embarrassment, anger, frustration, sadness, everything,” Stephen Hendry says as he remembers how his dominance of snooker unravelled into, in his mind, a shambling wreck of a game. When the end came, in the quarter-finals of the 2012 world championships, Hendry was so besieged by psychological demons “there was nothing positive left”. Hendry’s favourite sportsmen are Tiger Woods, Michael Schumacher, Nick Faldo and AP McCoy and he was once as imperious as they had been. He holds the record for the most world titles, with all seven being won in the 1990s, and he was world No 1 for eight successive seasons. But the great champions feel it most when vulnerability takes over. In his book Hendry details the way in which his manager, Ian Doyle, controlled him. Doyle even made Hendry break up with his girlfriend, Mandy, because he believed the young Scot should be consumed by snooker. Later, when he had finally married Mandy, Hendry horrified Doyle by mixing with other players. But Hendry believes now that losing his Ice Man image undermined him. Hendry was still disappointed when many younger players failed to travel with him to Belfast for Higgins’s funeral in 2010. He feels even deeper affection for White, his boyhood hero, whom he beat in four of his seven world championship final victories. I really liked the book, but can’t help wondering whether Stephen Hendry would have been able to re-invent himself the way Ronnie has done with the help of Steve Peters. In his biography, he tells us that he turned to various people in order to get help. But the help he was looking for was mainly aimed at changing his game in order to recapture his confidence and invincibility feeling. He wasn’t ready , or able, to try to change his own mentality nor his own expectations. “I didn’t want to go there” is a sentence that comes around a few times in this book. I certainly recommend every snooker fan to read this book. Ronnie and Rhiannon were again cooking together – live on Ronnie’s Facebook – as they prepare their new book “Top of your game”. So today was about Thai curry and crumble. Here is the video they shared. Ronnie also answered a few questions. His firs event (proper) should be the Shanghai Masters in September. I tried the crumble myself some weeks ago and it’s really, really nice!